Thanks to Stefan Andersson for the details and Robert Eldrim for the pictures. 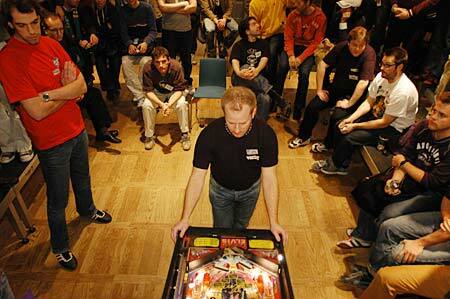 Last weekend, the Swedish Pinball Championship was held The Royal Institute of Technology in Stockholm. Judge Dredd, Medieval Madness, Attack From Mars, The Shadow, Lord Of The Rings, The Simpsons Pinball Party, Theatre of Magic, Tales of the Arabian Nights, Creature from the Black Lagoon, Monster Bash, Scared Stiff, The Addams Family, Indiana Jones, Champion Pub, RoadShow, Fish Tales, Twilight Zone, World Cup Soccer, Demolition Man and Bram Stoker's Dracula. 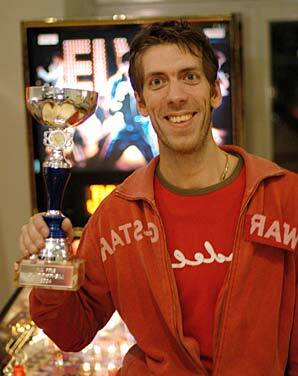 The competition was only for Swedes but the prizes were as good as any international tournament. First prize was a brand new Elvis pinball and second was a World Cup Soccer game. 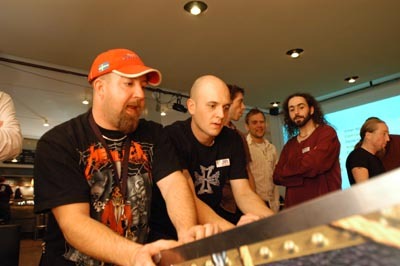 Each player got two attempts on four different machines and there were some pretty solid qualification scores this year, considering the quite difficult settings on the machines with tournament mode and no extra balls. But the final results were very different with Jörgen Holm taking first place and taking home the Elvis, Karl Broström was second, Mats Runsten third and Magnus Rostö fourth. The Championship was all over the news in Sweden. The two major, national, TV news programs both had interviews and footage from the competition on saturday evening. Most major newspapers and a lot of small local newspapers included something about the tournament as well. And there were interviews with some of the competitors on national radio when the competition had finished. Plans are already being drawn up for next year when it is hoped to hold another event in March, possibly an open championship for international visitors to compete. Or perhaps next year's November event will fulfil that role. 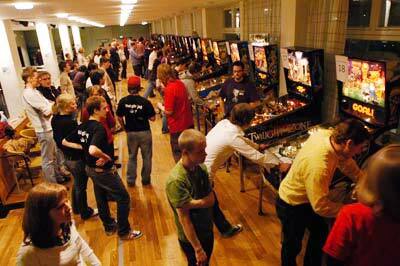 The Kungliga Tekniska Högskolan (The Royal Institute of Technology) normally has about six pinball games, is open to members of the public and is one of the best public places to play in the city.